Friday morning began with a much-needed lie-in until 10am, and still I didn't feel like getting up. Buried under comforters on a bed of pillows on an overcast, autumn morning... all I really wanted was a steaming mug of tea and a cookbook to read. But, you know, on the day of a wibbly-wobbly Halloween get-together, you force yourself out of bed, do a bit of cleaning and laundering, turn some Madeleine Peyroux on the stereo, and simmer up some salted caramel. Chelsea and Liz have had a few dinner parties already this semester, so Noosh and I decided it was our turn to host...something. 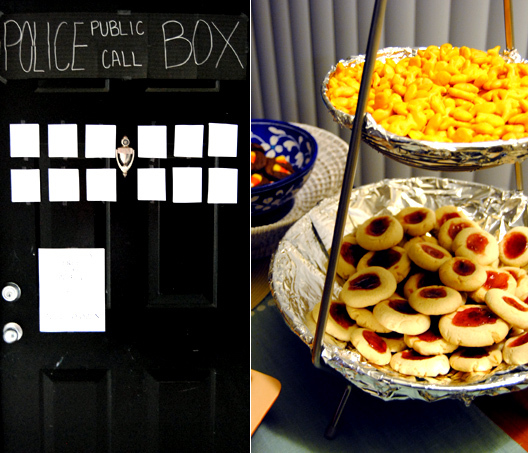 But really, Halloween weekend called for one thing and one thing only: a Doctor-Who themed party. Not that, you know, all of my friends are fans. In fact, the vast majority haven't watched. So really, it was more of an excuse for me to wear a bow-tie and cook up some fish custard. In a medium-sized bowl, whisk 1/2 cup of the milk, the cornstarch, and vanilla until blended. In a large saucepan, heat water and sugar on medium-high heat until boiling. Don't stir, but swirl the pan around to mix. Once boiling, lower the heat so that the syrup is at a simmer. Simmer until the caramel turns an amber color, add in salt, and swirl until incorporated, 8-10 minutes. Remove the pan from the heat and slowly pour in the remaining 3 1/2 cups milk, whisking constantly, until combined. The sugar may clump up spectacularly, but that is okay. Return the pan to the flame and heat on medium-high heat until just boiling, and then reduce heat to a simmer. Whisk the mixture until the caramel dissolves and the mixture thickens a bit, about 10 minutes. Add in the cornstarch mixture and whisk on medium flame until the mixture thickens, about 5 minutes. Pour the custard into a large glass dish or other heat proof dish. Allow the custard to cool, at least 30 minutes, then cover with plastic wrap and refrigerate for 2-3 hours, until the custard has thickened fully and set. In a medium bowl, combine flour, baking powder, and salt. In the bowl of an electric mixer, cream the butter and sugar on low speed, then increase to medium speed until light and fluffy, about 5 minutes. Add in egg and vanilla and mix, scraping down the sides of the bowl when necessary. Lower the speed and gradually add in flour mixture, mixing until just combined. Cover the top of the bowl in plastic wrap and refrigerate for at least 30 minutes. Preheat oven to 350 degrees Fahrenheit and line a baking sheet with parchment paper. In a food processor, pulse the graham crackers, butter, and sugar until the mixture is crumbly and sticks together. 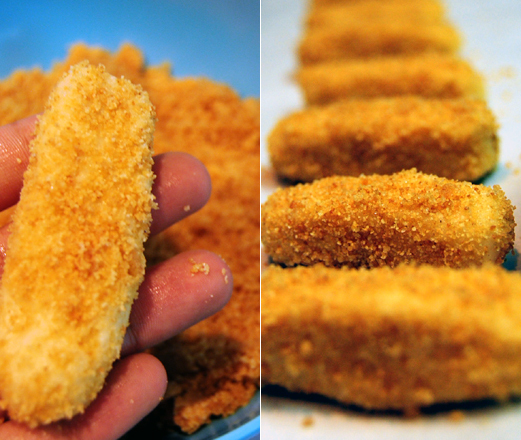 Once cookie dough is chilled, roll into "fish fingers," about 2 inches long and 1/2 inch wide. The smaller the better, as they will expand quite a bit while baking. 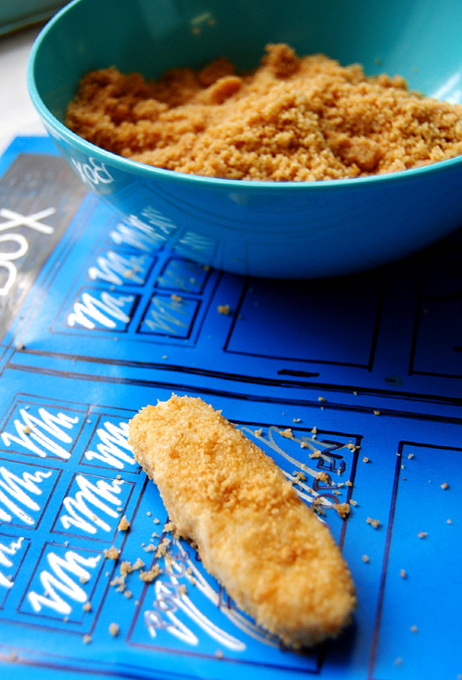 Roll the "fish finger" in the graham cracker mixture to "coat" and place on the baking sheet. Repeat with remaining dough, allowing about an inch space between cookies on the sheet. Bake for 14-16 minutes until golden brown. Allow cookies to cool on the sheet for about 5 minutes, then transfer cookies to a wire rack and let cool completely. 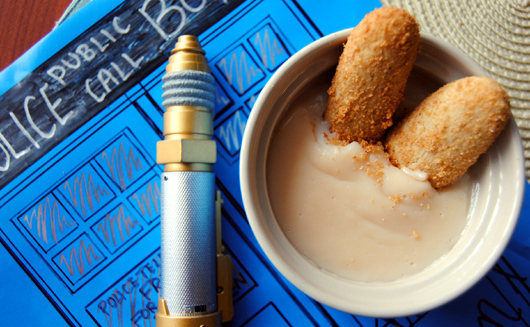 Serve "fish fingers" with custard. They taste splendid when eaten together, or either can be enjoyed separately. Allons-y! Noosh and I first stumbled upon this recipe a few months ago, and immediately I fell in love. The graham cracker "coating" is absolutely brilliant, and give the cookies the appearance of honest-to-God fish fingers. Words cannot describe how enamored I am with these things. They taste fantastic as well, which is only a plus, really. So after about 9 hours of cooking custard, baking fish fingers and jammie dodgers, listening to everything from Louis Armstrong to Don Omar with Noosh preparing the TARDIS door, our apartment was full of the sounds of laughter, chatter, music, The Green Lantern, Hello Kitty, and Freida Kalho, a rather disturbing-looking cockroach, unnamed doctors and Sabeen's-apartment-occupiers, hilarious and somewhat horrifying Bollywood dancing, and happy mouths munching on good food. A success in all senses of the word, over all. And by the time we were done cleaning up by around 1:30, I promptly passed out and slept for about 9 hours straight. And I've spent the vast majority of the hour and a half I've been up uploading photographs and listening to Cabin Pressure on Youtube [quite the brilliant radio show, sent to me by a sweet friend who knows of my utter obsession with Benedict Cumberbatch's brilliant theatrical timing and jaguar-hiding-in-a-cello voice], not really wanting to get out of my comfortable bed. Having discarded the suit-jacket, the bow-tie, and the formal button-down, though, I must say it's nice not to have a career that requires me to dress up like a flamboyant British gentleman on a daily basis. Fun as it was, I'll leave it to the professionals. I much prefer watching them from the comfort of my living room sofa. Preferably with a bowl of fish custard in hand. Goood god. This looks amazing. @Lexi: It's such a fun party to prepare for!! Thanks for the recipe! I've been invited to a Dr. Who party, and these are sure to impress! just your usual college girl with an unusual obsession with food. Design by Sabeen. Simple theme. Powered by Blogger.